﻿My cousin asked me a few weeks ago to create a cake for his daughter's 1st birthday. 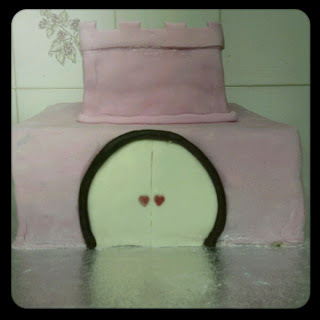 He and his wife had a castle cake in mind so I had my work cut out considering I'd never tried anything like that before. Shortly after being asked I jumped online and looked through pages of images on Google search and also spent a while on Youtube searching for ideas and inspiration. I stumbled across a video on Youtube that provided me with the perfect ideas for this cake. I knew I would have to use fondant icing again since it gives a better finish than buttercream for these kinds of projects, so this got me a little worried since I'm still not great at actually applying the fondant to the cake without a couple of holes or folds (I really should practise more). So I went and collected my equipment and supplies from a local decorating shop and just decided to go for it. I made two different kinds of cake for it, the base is devil's food cake and the upper tier is vanilla (just in case there are some crazy people at the party who have an aversion to chocolate). 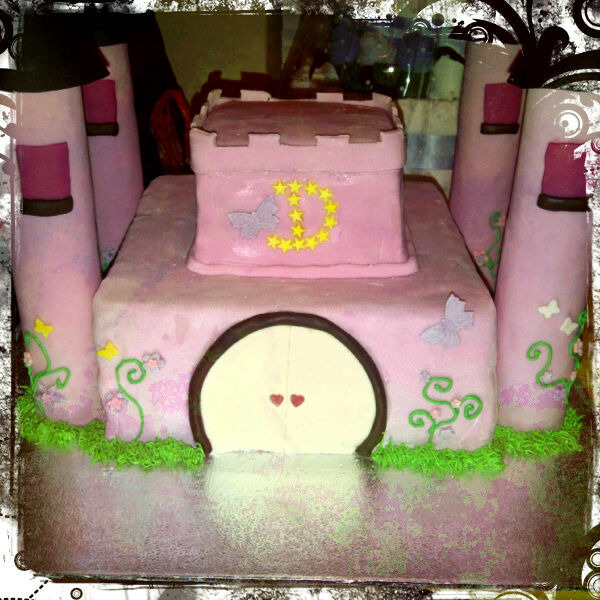 Each tier has two layers of cake in it, with vanilla buttercream in between and on top to secure the fondant. A friend came over to offer moral support for the evening but eventually got put to work helping me smooth the fondant onto the cake (thank you!). 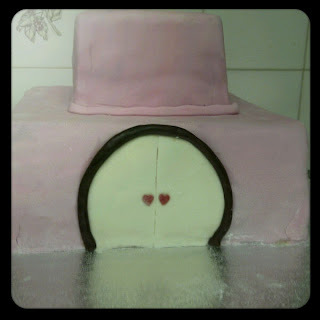 After the tiers were both covered I rolled out some more of the pink fondant to line the bottom of the top tier to neaten up the edge. 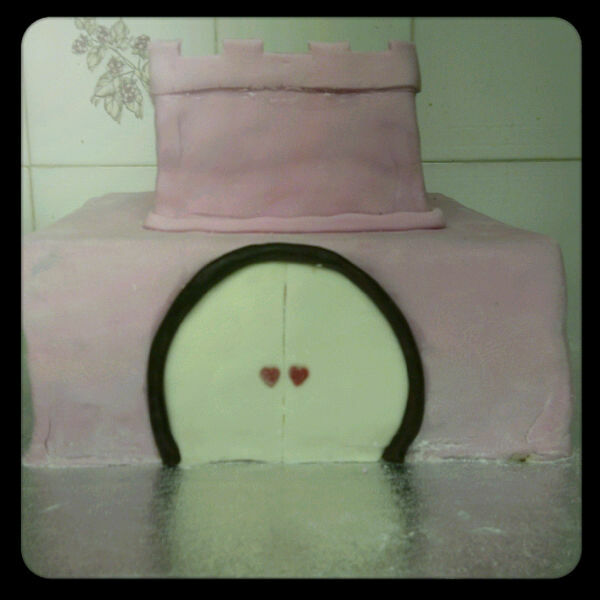 After that I used some ivory fondant to make doors and brown fondant rolled out to line it for the door frame. The door handles are heart shaped sprinkles which I got online. All of these details are secured with the edible glue I got as well, best investment ever. I have used it many, many times. ﻿To finish the top tier off I rolled out more of the pink fondant and made the trim for the top. It was just cut out by hand, I didn't measure it so it's not entirely even but I think it still looks pretty good! After the main work on the castle was done I added a 'D' on the front (birthday girl is Darcy). The stars are just cut out of yellow flower paste, but you can use sprinkles or fondant. If the stars don't tickle your fancy try flowers or butterflies! The large butterflies are also made from flower paste. 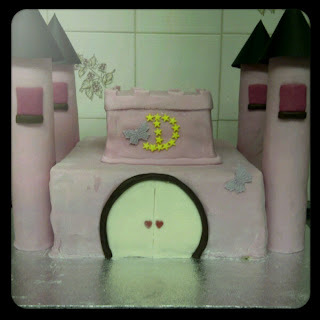 The towers are the cardboard tubes from kitchen paper, just covered in the pink fondant. 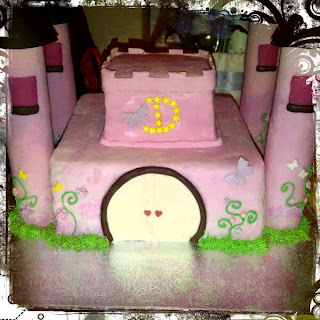 The windows are fuchsia fondant with the brown fondant serving as window ledges. The tops of the towers are made from black construction card (again, the colour is up to you, it just happened it was what I had on hand). The towers are fastened onto the cake with 2 toothpicks pushed into each. To finish the cake off, I piped buttercream vines onto the castle (the design goes all the way around and is on all of the towers but I only took a picture from the front). The flowers are all cut from flower paste with cutters (which I did on Monday) and stuck on with my edible glue. The smaller butterflies are sprinkles too. Finally, I used my grass piping nozzle to line the base with nice bright green buttercream grass. It may not be the neatest cake in the world but I have to say I am pretty darn happy with how it turned out! !